It's official. We fully expected No Man's Sky to come to PC, but up until now, all the talk has been around the PS4 version. Today, closing out the PC Gaming Show at E3, Hello Games founder Sean Murray took the stage to set all worries to rest: No Man's Sky is releasing on PC at the same time as the PS4 version. 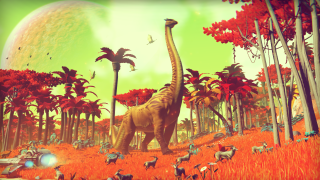 We saw No Man's Sky at last year's E3, and again at yesterday's Sony conference. You can watch a new trailer above.